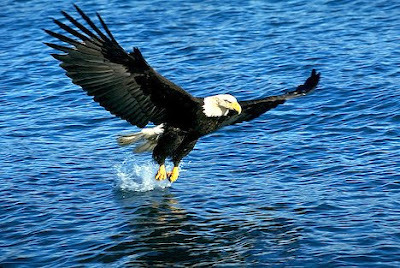 An eagle is the majestic bird which can teach us much about rising above the storms of life and learning to soar above the life challenges. Long time ago when the world was new, GOD made all the birds on the fifth day. He colored their feathers like an exquisite bouquet of flowers, gave many of them a distinctive song to sing. GOD instructed these wonderful creatures to greet each new day with a chorus of songs. And their voices announce the morning to this very day. Each of the birds is special, but to me the eagle is extraordinary. It possesses great beauty as well as tremendous strength and skill. 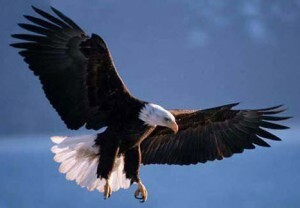 The eagle is also highly respected by man. It is used as national symbol in America and its image is engraved on the national seal. Each of these great birds seems to just glide on the air with movements that are more elegant than a waltz. But is there something we can learn from this majestic creature? Are there lessons that God wants us to understand? Consider how the eagle is made. Eagles are capable of seeing fish swimming from several hundred feet above the water. You most of the fish are counter-shaded, meaning they are darker on top and thus harder to see from above, this is quite an extraordinary feat. Ask any fisherman how difficult it is to see a fish swim just below the surface from a boat deck, let alone from several hundred feet. 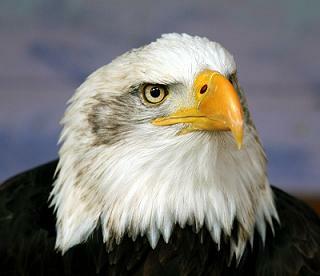 Eagles, like all birds, have color vision. Their eyes are almost as large as a human’s, but their sharpness is at least four times that of a person with perfect vision. The eagle can identify a rabbit moving almost a mile away. 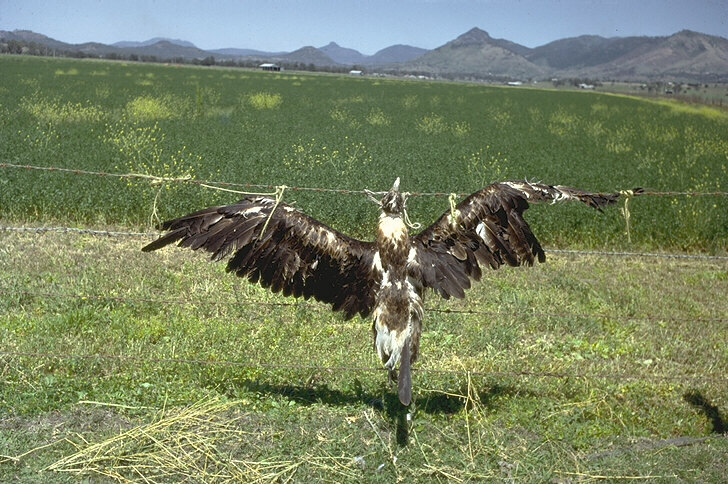 That means that an eagle flying at an altitude of 1,000 feet over open country could spot prey over an area of almost 3 square miles from a fixed position. Incredible is the vision of an eagle! An eagle can detect when a storm is approaching long before it breaks. It will actually fly to some high spot and wait for the winds to come. When the storm hits, it sets its wings so that the wind will pick it up and lift it above the storm. Isn't that remarkable? 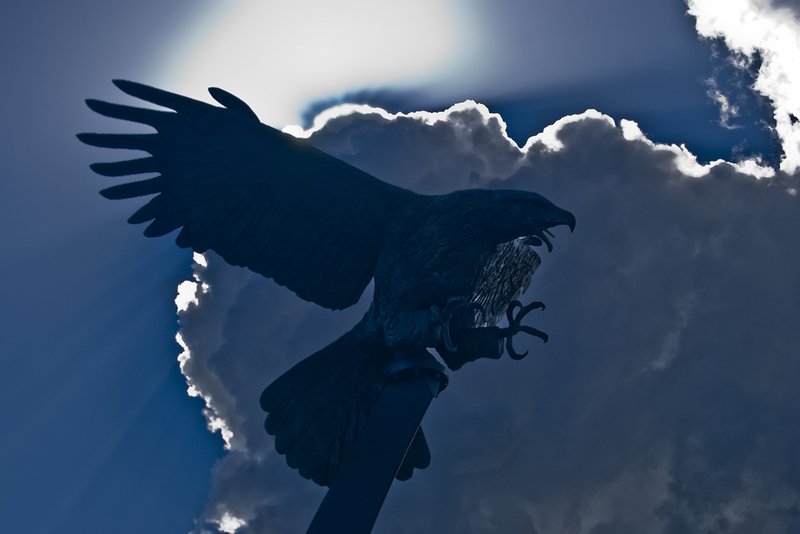 While the storm rages below, the eagle is soaring above. It does not escape the storm. It simply uses the storm to lift it higher. It rises on the winds that bring the storm. What an extraordinary way to deal with adversity! 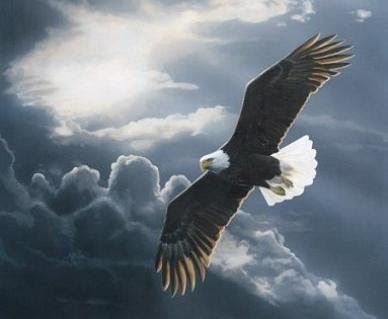 There is a wonderful lesson for God’s children to learn from the way an eagle approaches a storm. When the storms of life come upon us, we, too, can rise above them. We can lift ourselves above adversity by setting our minds and our hearts toward God. The storms do not have to overcome us any more than they overcome the eagle. We can allow God’s power to lift us above them. The storms (or trials) of life can actually help us in our walk of faith. This is because they build something in us that will be a part of our lives forever. Notice what Paul wrote to the congregation at Corinth. “For our light affliction, which is but for a moment, is working for us a far more exceeding and eternal weight of glory” (2 Corinthians 4:17). Here is something to think about. When the eagle flies above the storm, he is in a sense overcoming it. But he does so in a most interesting way. He uses the strength of the storm to rise above it. That is one of the things God wants us to do. 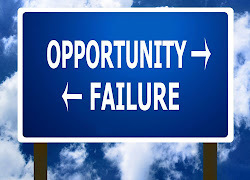 We can use adversity for gain. We need to learn from trials to grow from the experience and be made better (James 1:2-3). Sometimes we should “escape” trials (1 Corinthians 10:13). Sometimes we should “flee” (Matthew 10:23). And at other times, trials are to be confronted and endured (2 Thessalonians 1:4; 2 Timothy 4:5; Hebrews 12:7). We must face the things that challenge us and grow in virtue because of the challenge. God is looking for overcomers. And He has a wonderful promise for them. “To him who overcomes I will grant to sit with Me on My throne, as I also overcame and sat down with My Father on His throne” (Revelation 3:21). In their book tittled "Faith in the Night Seasons", Chuck & Nancy Missler began with a story about a wounded eaglet that was rescued by a kind farmer. He found the bird in one of his fields and so took him home, tended to his wounds and then placed him outside in the barnyard to recover. But then one day, one of the farmer’s friends spotted the eagle and asked, “Why in the world is that bird acting like a chicken?” The farmer explained what had happened. Even so, the man could hardly accept the situation. “It’s just not right,” said the friend. “The Creator made that bird to soar in the heavens, not scavenge in the barnyard!” So he picked up the unsuspecting eagle, climbed onto a nearby fence post, and tossed him into the air. But the confused bird just fell back to earth and searched for his feathered friends. The friend went home that night dejected and could barely sleep as he remembered the sight of those powerful talons caked with barnyard mud. He couldn’t bear the thought, so the very next day, he headed back to the farm for another try. This time he carried the eagle to the top of a nearby mountain where the sky unfolded in a limitless horizon. He looked into the eagle’s eyes and cried out, “Don’t you understand? 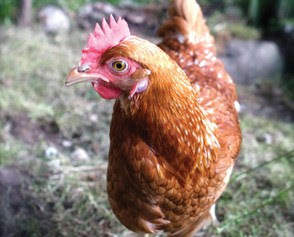 You weren’t made to live like a chicken! Why would you want to stay down here when you were born for the sky?” As the man held the confused bird, he made sure the eagle was facing into the brilliant light of the setting sun. Then he powerfully heaved the bird into the sky, and this time the eagle opened his wings, looked at the sun, caught the updraft rising from the valley and disappeared into the clouds of heaven. God’s children were born to fly. They were created by a loving God to soar. He has called them to live in the heights, yet too many have huddled together in the barnyard and become content and comfortable with crumbs. Helen Keller once said, “One can never consent to creep when he feels an impulse to soar.” God’s people need to cultivate and exercise that impulse. 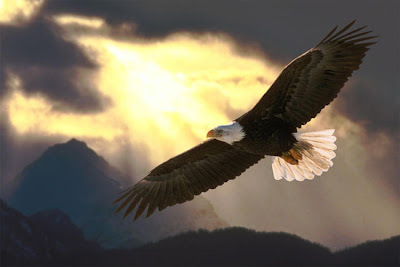 If we do, we will one day soar like eagles (Isaiah 40:31). GOD DID NOT CREATE TO LIVE CHICKEN, HE CREATED US TO SOAR LIKE AN EAGLE. BUT WE OFTEN CHOOSE TO LIVE LIKE CHICKEN. 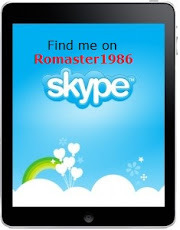 Wonderful message of encouragement Rodrick. God Bless - Psalm 33. Amen! Thank you Rodrick, for putting this word of encouragement out in such a timely manner. I have often heard parts of this story from Joyce Meyer but not in such detail. 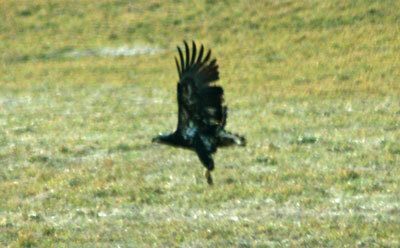 As I was impressed this morning to search for pictures of eagles soaring I click on one of yours. As I proceeded to read the story, my eyes begin to fill with tears. It witnessed with my spirit concerning where God is wanting to take me. He has often shown me pictures of myself with wings like and eagle and Him teaching me to soar. The word I could hear the Spirit saying, It's time to take flight, it's time to take flight. Church Arise!